Home News & Events Lectures & Lectureships Elia M. Ayoub Lectureship Elia M. Ayoub, M.D. 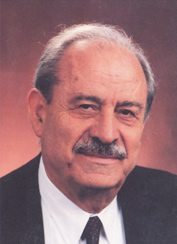 Dr. Elia M. Ayoub was educated at the American University of Beirut, Lebanon. He was a Professor of Pediatrics for the University of Florida College of Medicine in Gainesville since 1969 and Professor in Immunology and Microbiology since 1972. In 1984, Dr. Ayoub won the Hippocratic Award for Teaching Excellence, the highest medical student teaching award in the College of Medicine. In 1994 he was named a Distinguished Service Professor. Dr. Ayoub also served the College of Medicine as the Vice-Chairman for Academic Affairs in the Department of Pediatrics. Dr. Ayoub was heavily involved in various committees of the American Heart Association (AHA). He served on the Council on Rheumatic Fever and Congenital Heart Disease from 1970 through 1974 and was also a member of the Executive Committee of the Council on Cardiovascular Disease in the Young from 1977 through 1980. Dr. Ayoub was awarded by the AHA the Bronze Medal for Meritorious Service in 1974, the Silver Medal in 1975, the Award of Distinction in 1977, and for his many years of dedicated service. He was also awarded the T. Duckett Jones Lecturer Award by the American Heart Association. Dr. Ayoub was a member of the Society for Pediatric Research, the American Pediatrics Society, the Rheumatology Section of the American Academy of Pediatrics and had publications in various books and journals. Dr. Ayoub’s research was on protein markers in pediatric patients who developed streptococcal diseases to see why some develop complications from rheumatic fever and some do not. Rheumatic fever remains the single most common cause of acquired heart disease in children throughout the world. He presented his findings in a keynote address at the 8th Annual Lewis W. Wannamaker Memorial Lecture in 1991 at the University of Minnesota.